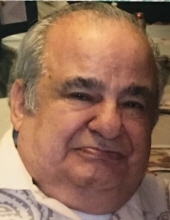 Celebrating the life of Salvatore J. Longo, Jr.
Obituary for Salvatore J. Longo, Jr.
Salvatore J. Longo, Jr., age 81, of West View, passed away on Friday, March 15, 2019. Born December 3, 1937 in Pittsburgh, he was the son of the late Salvatore J. and Marion (Gillembardo) Longo, Sr. He worked for Henry Miller Spring Mill. He is survived by his wife, Diane C. (Weber) Longo; sons, David G., James T. (Lois), Donald J. (Cindi) Longo; daughters, Deborah J. Contestabile and Diane F. (Aaron) Loritts; thirteen grandchildren; seven great grandchildren; sister, Mary William and brother, Joe Longo. He was preceded in death by his brother, Dennis and daughter in law, Karen. Arrangements have been entrusted to King Funeral Home and Cremation Services, Inc.
To send flowers or a remembrance gift to the family of Salvatore J. Longo, Jr., please visit our Tribute Store. "Email Address" would like to share the life celebration of Salvatore J. Longo, Jr.. Click on the "link" to go to share a favorite memory or leave a condolence message for the family.